Contrabass Chimes are structurally and musically exquisite. Contrabass Chimes range in sizes from 7' to 9', pitched one octave below middle C and when struck deliver fun, euphonic sounds that ring always in tune. 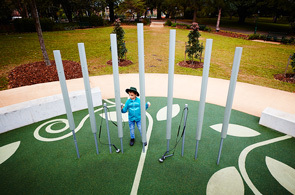 This set of 7 chimes are constructed with 4" diameter, heavy-duty anodized aluminum tubing and numbered #1 longest to #7 shortest so they can be laid out in a variety of patterns such as: wave, straight line or in an arc/horseshoe to produce a "surround sound" effect. The recommended spacing for installation of the Contrabass Chimes is to gap the chimes at 18" and gap the mallet poles at 11" on both sides in-between the chimes. 4 total mallets with 2 mallet poles,	the mallets are attached to the poles via nylon coated steel cables.